The addition of new collaborator is a straightforward process. 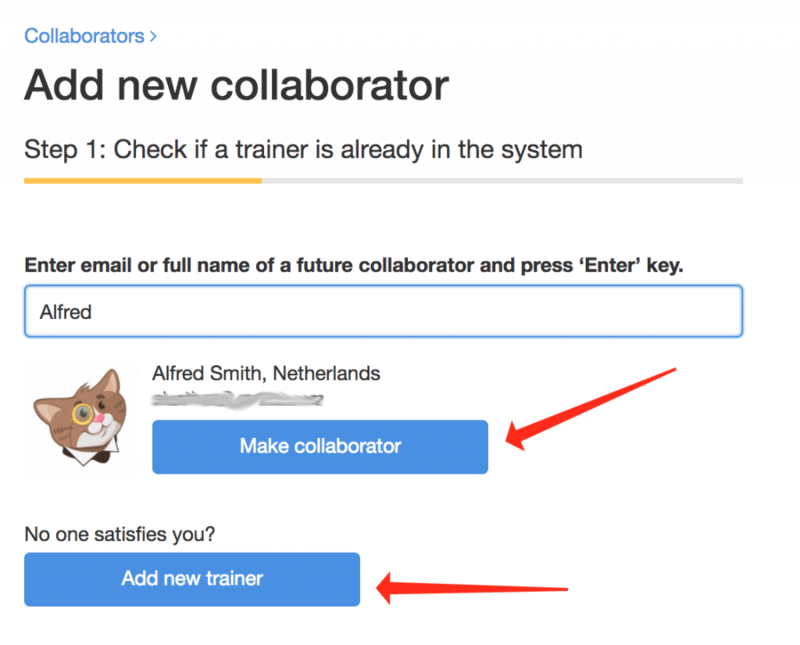 You can select collaborators from existing trainers or add a new one. Open your account settings and click Collaboration in the left-side menu. Note: You usually collaborate with others on a specific topic or area of knowledge. In Workshop Butler we call these topics categories. 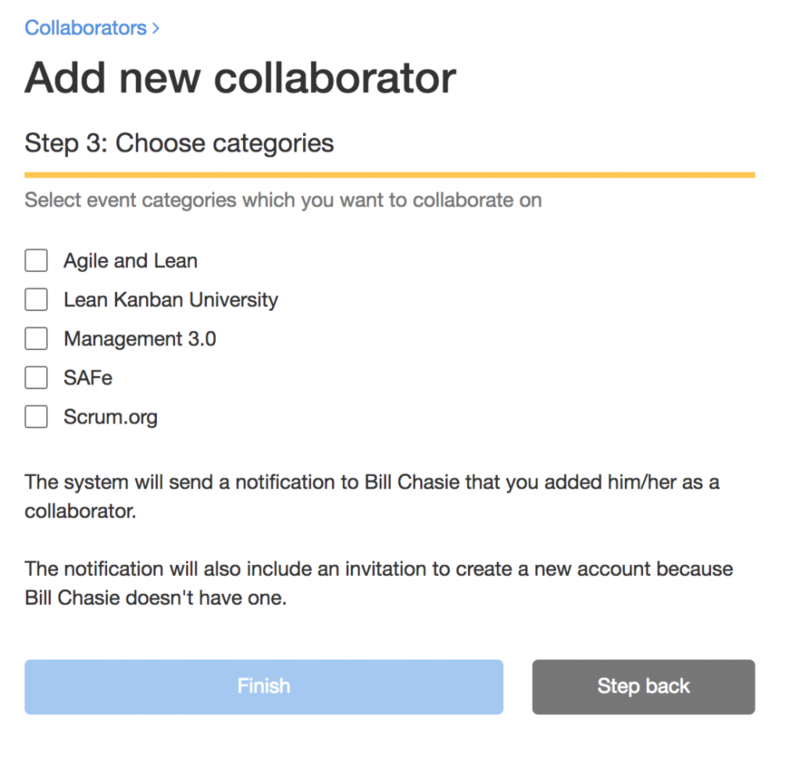 If you haven’t created any category yet, you won’t be able to add a collaborator. The system informs you about it by switching Add collaborator button to Add category button. Enter a name of a potential collaborator or an email. The platform shows you if this person has already an account. Depending on the results, click a correct button. Enter first and last name, email, and country of living. 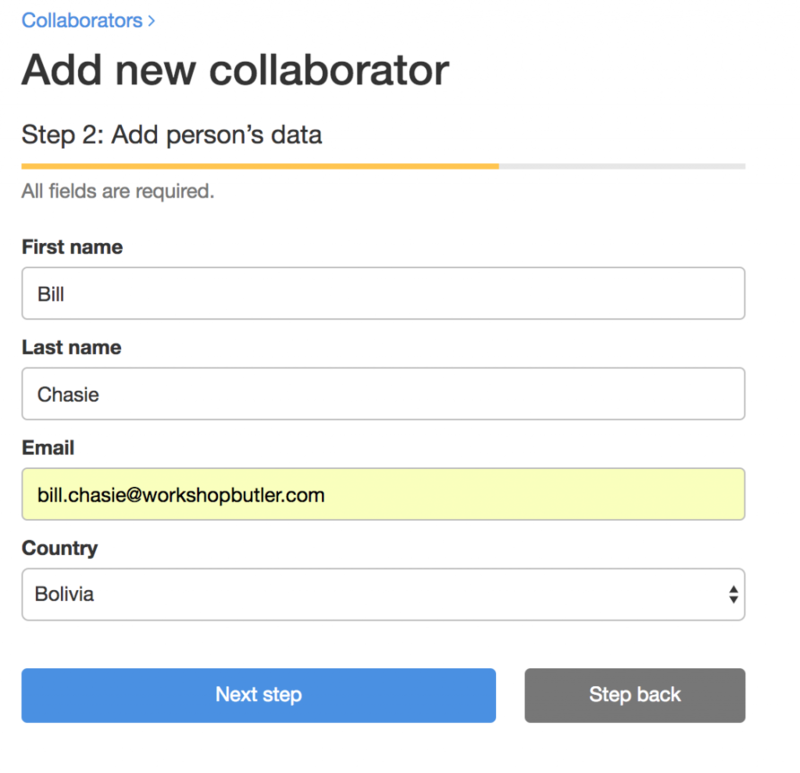 Workshop Butler uses this info to create an inactive account for a new collaborator. The collaborator could activate the account later to enjoy all the advantages of our platform. Note: after adding a new collaborator, you can enter additional info about this trainer such as bio or photo. However, you can make these changes while the account of a newly added trainer is inactive. After this trainer activates the account by logging in the platform for the first time, you won’t be able to change his or her personal data anymore. Pick as many categories as you need. All these categories will appear in the cabinet of the collaborator. After you click Save button, the platform creates a new collaborator and notifies that person you are collaborators now. Alfred Smith has added you as a collaborator to Scrum and Facilitation categories. If you or Alfred add a new workshop under one of these categories, it will appear on yours and Alfred’s calendar. You can manage attendees, check registrations and process evaluations together. To learn more about collaboration, read …. Alfred Smith has added you as a collaborator to Scrum and Facilitation categories. It means Alfred can add workshops run by you and promote them on his/her website. If Alfred organizes or promotes a workshop for you, there is a chance you won’t hear from us anymore – Alfred may decide to handle all communications with registrants and attendees without disturbing you. create a new password, log into the system and look around.